This is Steve again from SKG Renovations (Steve’s Bio). In this Shower Niche Buyers Guide I will review products from each of the 3 categories of shower niches. I have chosen a few products that are popular in bathroom renovations today – products that I have personally installed as a bathroom remodel contractor. My reviews will start with a brief description of the product. I’ll also include the product cost, estimated install labor cost, and links to sites that sell it. *The custom built tiled shower niche is obviously not a self contained unit that can be purchased and installed like the other two types. As such, I will attempt to provide some perspective of the price of both materials and labour, with a few assumptions of size, style and placement, of course. Before we dive into the list I should mention that one of the premade finished stainless steel shower niche products (the Redblock Shower Niche) is a product from a company that I am part owner of. Now that we have that business out of the way, lets get into it shall we? Note: This shower niche category includes products that are designed to be tiled (or tile ready). This means that the total installation costs must also include labor cost for framing attachment and tile application. A very rough labor estimate of this service would be $250 – $350 (depending on type of tile and size of niche). 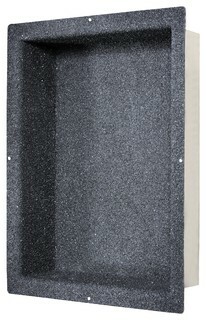 This is one of the most popular prefabricated / tile ready shower niche products available. There are a few sizes available so you can choose the one that best suites your needs. This is the style of prefab niche that is made out of 1/2″ thick foam board with a fabric-like coating that is designed to bond with most standard thin-set tile mortars. It is relatively easy to install but it requires some framing to be installed behind it’s mounting/ bonding flange so it can be fixed firmly on all sides and firmly bonded to the waterproofing membrane. Since this niche is made out of foam board, it’s pretty important to follow the manufacturers install instructions when attaching it to the shower wall to ensure proper support. This is in fact one of its disadvantages because additional framing must be installed behind the mounting flange for niche attachment but also behind the backer board to maintain wallboard rigidity. It should also be mentioned that the foam boards that these niches are made from can be damaged or perforated fairly easily so they require careful handling during installation and tiling. Keep in mind that these preformed shower niches are usually designed to fit between two adjacent wall studs, so alterations to the structural framing is generally not required. 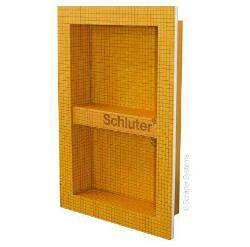 There are many other foam board style prefabricated shower niche options available from other manufacturers (most are slightly cheaper), but most people choose this niche because Schluter Systems one of the most trusted brands. 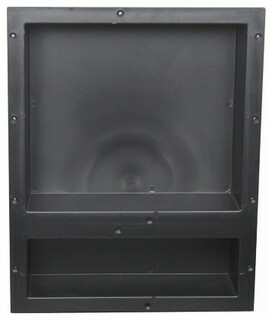 Other reliable brands of these foam board niches include Wedi, Laticrete, & Hydro-blok. The additional benefit of the Wedi and Hydro-Blok niches is that they both have a cement coating on their surface which improves tile bonding and rigidity. The foam shower niches are all generally very similar, but I prefer these two niches because of this cement coating. This is also one of the most popular prefab tile ready shower niches available but it is made out of plastic instead of foam board. This niche also comes in a few sizes to suite your needs, much like the foam board shower niches. 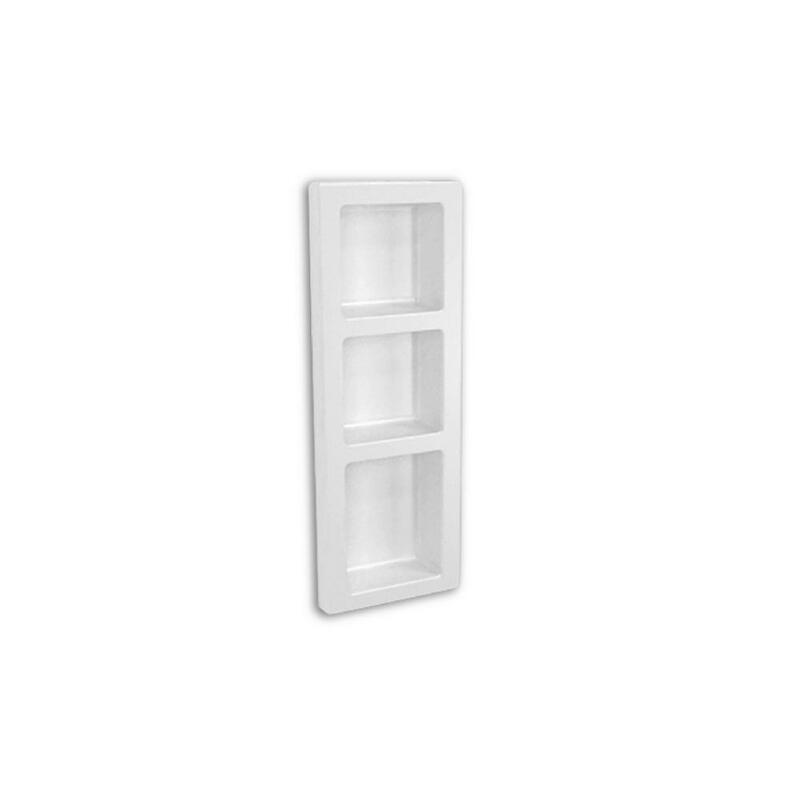 In general the plastic shower niches are a great alternative to the foam board niche. Their mounting procedures are also the same, so this niche also requires additional framing for full support of the wallboard and niche mounting flange. They are preferred by some because of their increased rigidity while others feel that they are more of a hassle to use because an acrylic based tile adhesive is required for tile fixing, rather than a standard thin-set mortar*. Personally I believe that foam board and plastic niches are basically equivalent, as long as they are mounted according to the manufacturers instructions. The Redi Niche is also sized specifically to mount between the wall studs so alterations to the structural framing is generally not required. 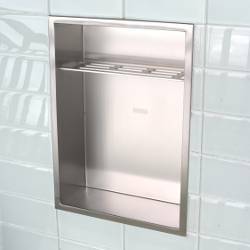 Other reputable manufacturers of plastic shower niches include EZ-Niche and Durock (*apparently standard thin-set can be used with Durock prefabricated shower niches). This preformed/ prefab shower niche is one of the only welded stainless steel shower niches that is designed to be finished with tile. 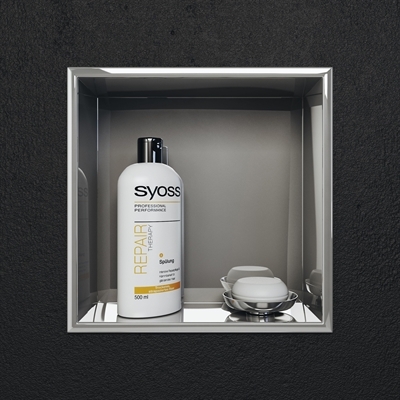 The Dawn niche is bonded with an acrylic coating designed for tile attachment. I have used an acrylic tile adhesive when setting tile in this niche because I personally think it’s the safest bet. The install instructions on their website don’t mention anything about it. The major advantage of this type of product is that it is constructed from welded stainless steel sheets. This means that it’s extremely structurally rigid and difficult to damage during or after installation. Another advantage is that it can be flush mounted directly on the tile backer board surface as long as there is framing behind. Since this niche is made from welded sheets of stainless steel, it would also be safe to say that it will never leak. It would be impossible to say if the coating would ever de-laminate from the stainless steel if water penetrated under the tile for an extended period of time but I would say that the risk of this occurring is quite low. It also comes with a finished stainless steel shelf so you don’t need to construct a tiled shelf or buy a custom piece of glass for a shelf. Among the preformed niches designed to be tiled, I definitely prefer this one because it seems so much more solid and leak proof however, this is only my opinion. Note: This shower niche category includes products that are finished so there is no extra labor cost for tiling. However, there would still likely be a labor charge of around $50 – $100 for backer board cutting and framing attachment. 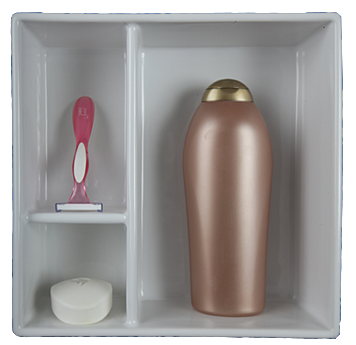 * Each of these two categories can include products made from stainless steel, ceramic or plastic. This shower niche is constructed of welded stainless steel sheets and is finished in a natural stainless steel finish (sandblasted PVD finishes coming soon). It differs greatly from the above mentioned shower niches because it has a finished stainless steel surface so it does not need to be tiled or finished in any way after install. Like the tiling niches above, this niche also incorporates a mounting and bonding flange into its structure so it can be firmly attached to the framing, and bonded to any liquid or sheet style waterproofing membrane. This shower niche is also unique because a perforated shelf (or two, depending on model) is built into the niche design, so your soaps, razors etc. will stay in their place. It also includes an attractive built in tile border flange (or tile edge trim) that borders your wall tile and eliminates the need to install any tile edge trim profile around the niche’s perimeter. I recommend this finished shower niche above all others because it includes features that none of the other niches include at it’s price point. But as I mentioned earlier, I helped design this shower niche and I’m a part owner in the company. There is one other finished stainless steel shower niche available from Easy Drain which also incorporates a mounting and membrane bonding flange into its design. A very solid product as well but a little more expensive and a little more complicated to install. This type of shower niche is made completely out of ceramic and has a finished glazed surface. The higher radius (curvy) look of it conveys a bit more of a classic feel compared with the more modern tiled niches or finished stainless steel shower niches. The particular model shown has a mounting and tiling flange so it can be bonded to the waterproofing membrane. The mounting flange has no mounting holes so it must be fixed in place by glue or thin set mortar.. It also includes a tile border flange so there’s no need to install a trim around the niche perimeter. This model also has a handy built in shelves. 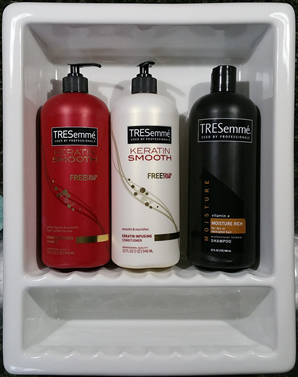 These particular shelves are extremely slippery so your soap can easily get away from you. I have installed this style of shower niche before so I can say that it is definitely possible to attach it to your shower wall waterproofing membrane but it is not very easy to do. Because the mounting flange is quite thick, you must recess it into the surface of the backer board to make room for your tile. This procedure will weaken the backer board, so it would also be a good idea to support the perimeter with some back framing. I installed a plastic membrane bonding finished shower niche a few years ago that included a mounting and membrane mounting flange, but I recently scoured the internet and could not find this particular unit nor any others. I was quite surprised by this, but I’m guessing that it’s related to the declining popularity of plastic niches in general. Note: This sub-category includes only finished shower niches, so there’s no tiling involved. This niche requires a hole to be cut in the backer board, but there is no framing attachment. You can assume around $50 – $100 labor for this work. 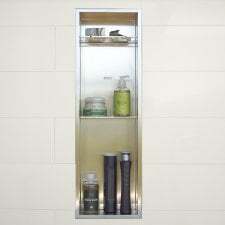 This shower niche is constructed of welded stainless steel sheets and has polished stainless steel finish. This niche differs significantly from the finished shower niche products above because it does not have an integrated mounting/ bonding flange so it cannot be screwed to the shower wall framing and will not bond to the waterproofing membrane. It is mounted simply by pushing into a square hole cut into the tile and backer board during a shower remodel. There is an overlap flange that is glued to the finished tile surface with a bead of silicon. Some would argue that this is the biggest flaw of this style of niche because the integrity of the waterproofing membrane is so important in all modern shower rebuilds. The only protection you have from water leaking into your stud wall is a single bead of silicon that attaches the niche to the tile. As such, I do not recommend installing this style of shower niche. The retrofit shower niche is the easiest shower niche to install of all the niche types. This is a retrofit style of finished ceramic shower niche that is produced and sold by the same manufacturer as the above ceramic niche, but this one includes a retrofit (overlap) flange rather than a membrane mounting flange. Similar to the Cantrio niche above, this niche just slides into a hole that is cut into the backer board during a remodel. The shower wall is tiled around the hole and the niche’s overlap flange is glued to the finished tile with a bead of silicon. As with all retrofit niches, this niche cannot be screwed to the shower wall framing and does not bond to the shower wall waterproofing membrane. As I mentioned before, I do not recommend that any shower niche be installed if it cannot bond to the shower wall waterproofing membrane. This again is a retrofit shower niche constructed of plastic (acrylic) that mounts in an identical manner as all the rest of the retrofit shower niches. It is also glued to the tile surface and is not bonded to the waterproofing membrane. The primary difference between any plastic shower niche and a steel or ceramic niche, is that the surface will eventually discolor and become brittle with exposure to heat and light (as all acrylics do). This means that it will not last as long as the other two retrofit niche types, even if it is cared for gingerly. Something to keep in mind. I do not recommend this niche because it does not bond to the shower wall waterproofing membrane. As I mentioned earlier, it’s difficult to include this third shower niche category into the buyers guide simply because custom built niches involve several different materials AND a significant labour element. These material and labour cost components are very difficult to quantify because of the vast array of material suppliers, infinite variations in niche size, and varying labour rates. However to provide you with some perspective, I can tell you that SKG charges a minimum shower niche cost of $500 (materials and labour, including tiling) to construct a custom built, tiled shower niche of approximately 10″ x 12″ (with one glass shelf). This assumes that the appropriate tile backer board and waterproofing are included in this installation. As you would expect, this cost increases as the size increases. It increases significantly more if the niche spans more than one stud cavity (width between two adjacent studs) because additional structural support framing is required. I hope you can use some of my practical shower niche info & reviews to decide on the right finished, tile-ready or custom shower niche for you and your family. Good luck on your journey! And don’t forget to leave a comment or any questions you may have about the different shower niche types and models. I am excited to hear from you!